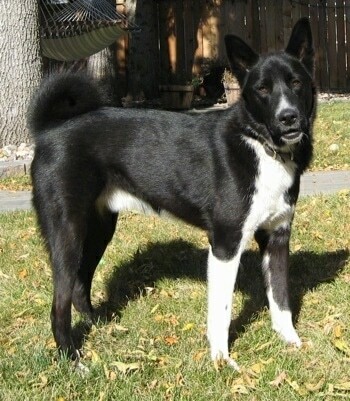 The Karelian Bear Dog has small ears that are cocked and point outward slightly. They are lined with dense fur, reducing the risk of frostbite. The shorthaired all-weather coat consists of straight, stiff hair while the under-layer is soft and dense. The thighs are covered in thick hair. Like the Russo-European Laika, the breed has a distinctive black and white coat, which is unusual for northern Spitz-type dogs. A copper tint is typical. Black speckles in the white are considered a fault. The dog should be primarily black with white markings, which are distinct and occur on the head, neck, chest, abdomen and legs. The jaws are immensely powerful. The tail is long. The small eyes show intense concentration. The tail curls over the back in a typical Spitz arch. Robustly built, well-boned and of moderate size, the Karelian Bear Dog is slightly longer than he is tall. The head is shaped as a blunt wedge. The body is sturdy and the back is well developed. The Karelian Bear Dog has a good sense of humor. It is sensitive, independent, intelligent, skillful, tough on itself and energetic. A robust, persistent, and powerful dog, it is willing to take on virtually any game animal. This dog is very loyal to its owner's family and makes a good household companion when it has owners who know how to display leadership and the dog is extensively trained. 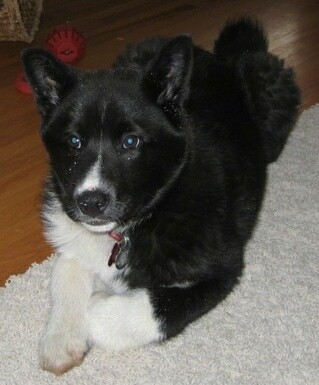 This is not a breed for the casual pet owner; the Karelian Bear Dog is a hunter of unyielding bravery and determination. It will put a bear to flight or attack it with great pugnacity. The true outdoors enthusiast and dedicated hunter can look to this hard-working breed with delight and utter satisfaction. Owners must be capable of handling this very forceful canine. An owner who understands canine behavior, how to communicate by displaying authority over the dog, proper training and socialization are absolute musts. It may try to dominate other dogs and is perfectly willing to fight. Owners must communicate this is not an acceptable behavior. This dog needs a handler with natural authority. The training should be very consistent with both a firm hand and affection. This is not a breed for inexperienced dog owners. They are affectionate toward people and will announce both welcome and unwelcome visitors. Visitors the dog knows well will get an enthusiastic welcome while strangers may be treated coldly. This breed is very protective. They will protect you with their life. The Karelian Bear Dog can live with other household animals if they know where their place is in their pack (below all others) and if the training and socialization is properly handled. This breed has a small appetite for its size. This is a fairly healthy breed. The Karelian Bear Dog is not recommended for apartment life. It should have acreage or a farm so it can run. These animals do not like to be confined. They can be kept in an outdoor kennel as long as they get plenty of chances to run. The Karelian Bear Dog is a very energetic dog. It should be exercised with a brisk walk at least an hour each day. If you can keep this dog well under control, it will enjoy exercising by running alongside a bicycle. If it does not get enough exercise it will become bored and may be destructive inside the house. Never let two Karelian Bear Dogs run together free—for they will go hunting. Make sure your yard is well-fenced so your Karelian Bear Dog does not take off on a hunting adventure. The all-weather coat is easy to care for, requiring little attention. Use a metal comb when the dog is shedding for easy removal of the lose hair from the undercoat. Like other Arctic dogs, the Karelian Bear Dog does not have doggie odor. This breed is an average shedder. The area once known as Karelia in northern Europe has always been populated by tough, big-game hunting canines. For a long time, similar dogs had been bred in Karelia for hunting large game. These dogs were known to have followed the first settlers to Finland thousands of years ago. These early tribes of people survived on what they could hunt, which is why dogs that were hardy, brave and tough enough to tackle bear, wolf and lynx were so important. The Karelian Bear Dog closely resembles the Russo-European Laika. It evolved in the part of Finland claimed by the Soviet Union in the early part of the 20th century. The Karelian Bear Dog, which is more numerous outside its own country than any of the Russian Laikas, is used by elk hunters throughout Finland, Sweden and Norway. It was first exhibited at a dog show in Helsinki in 1936, but after World War II the breed almost became extinct. All modern Karelians are traced back to forty dogs found and saved after the war. 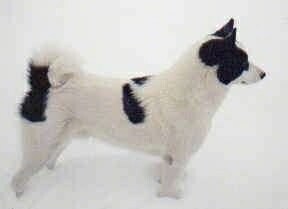 The Karelian Bear Dog was very popular toward the turn of the century when it could be found in vast numbers. Its numbers declined in the 1960s, but its popularity has been on the rise and it is now being bred in North America and many European countries. Among this avid hunter's game are the buck, wild boar, hare and moose. He is also fearless enough to fight the wolf and bear and therefore functioned as a protector by hunting these large wild animals. In his homeland of Finland, the dog is used mostly for elk and is the favored dog of native big-game hunters. "My dog Zeus at 10 months—perfect temperament, great movement, stunning structure; he makes our life full of joy. Great breed; very underrated, but it will change." 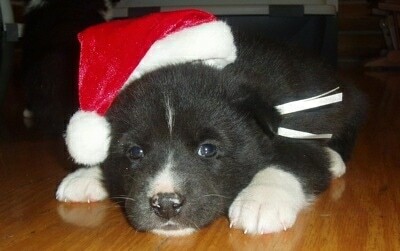 McKinley the Karelian Bear Dog as a puppy at 3 months old wearing a Santa hat—"He is playful, cuddly and very curious."